I'm supposed to be writing right now. At least that's what I told myself that I'm supposed to be doing. All the kids are sleeping at the same time and the house is quiet and it's the perfect time. So what am I doing instead? 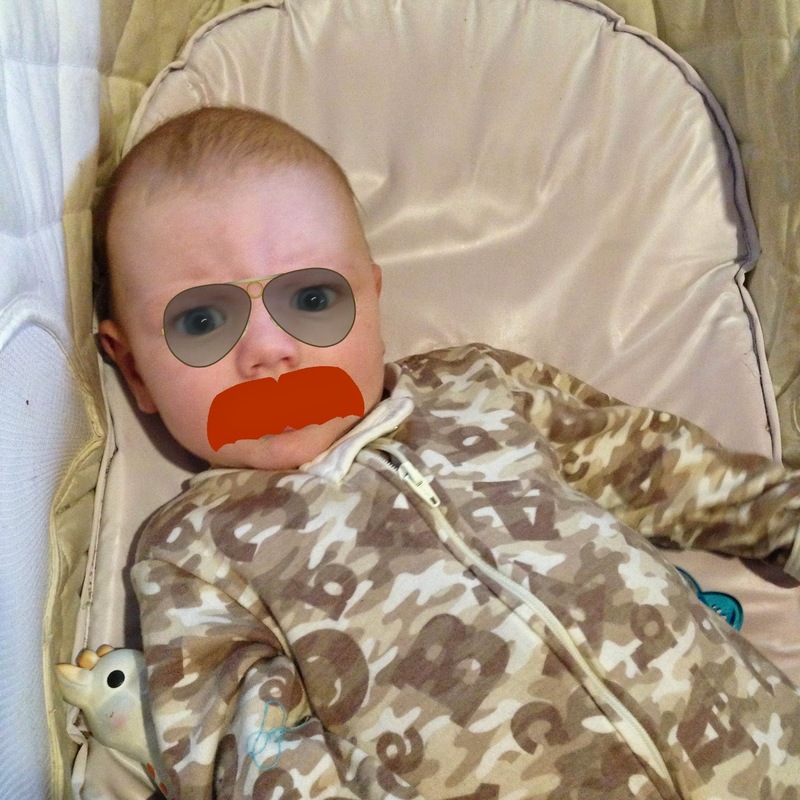 Using Pic Monkey to photo shop mustaches onto frowning pictures of James. He really has mastered the firmly disapproving look, along with the confused about why the house is so loud look and the what am I doing here with all these unruly children look. 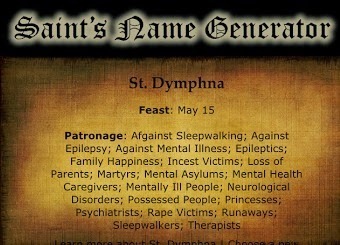 Did you use Jennifer Fulwiler's Saint Name Generator this year? 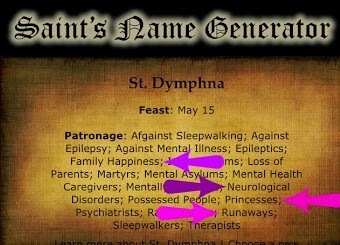 She's the patron saint of Family Happiness (can't lose with that), Neurological Disorders, Princesses and Runaways. It's like she's the patron saint of all the things rolled in to one. Now nobody in this house better start sleepwalking. Finally after dinner Sadie headed out to her troop meeting where a nun began to teach the younger girls in the group (like Sadie) how to sew. And that is a Friday in our house this January. I finally decided that it was time to move the girls to a new doctor's office. When Patch was born I was able to get him into an office that was full and couldn't take the girls. When I called this week they were actually quite surprised because we're in there so often (they're in the same office as OT) that they thought the girls were already patients. So they accepted them immediately and it's the doctor that James has been seeing, who is really great, so I think that this should be a much, much better fit, instead of just seeing whatever resident is at the clinic on any given day and having to explain Mae's entire medical history over and over and over again. 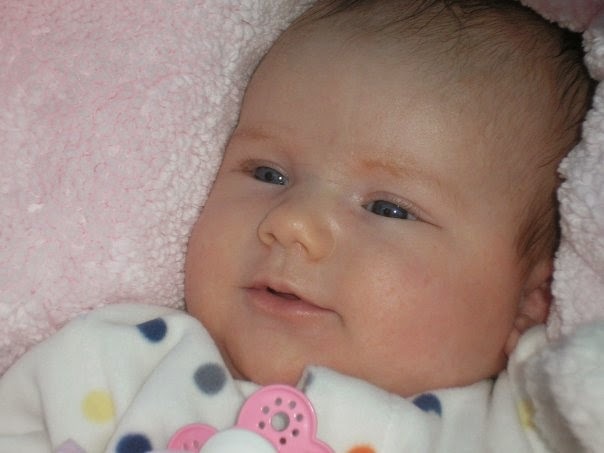 I think having one consistent doctor will be so much less stressful during appointments. Me: "So if someday, when we move, you could have your own room, would you want your own room? Or would you want to share a room with your sister?" I asked this question because Maggie's night waking episodes have started again and we never know whether she's going to sleep fifteen hours or get up at 1 am to jump on the bed for a couple (or five) hours. Sadie: "What do you mean?" Me: "Well, I'm not saying that we'll have enough rooms for you to have your own room, someday, when we move. But if we did, would you want to have your own room, with your bed, where you could go in and close the door? Or would you want to share with Maggie?" Sadie: "I want to share with Maggie." I'll admit I was surprised by the answer. Then again, the girls almost always end up cuddled up together by morning... and while sometimes she's sleepy, sometimes she's totally on board with getting up to jump on the bed in the middle of the night. 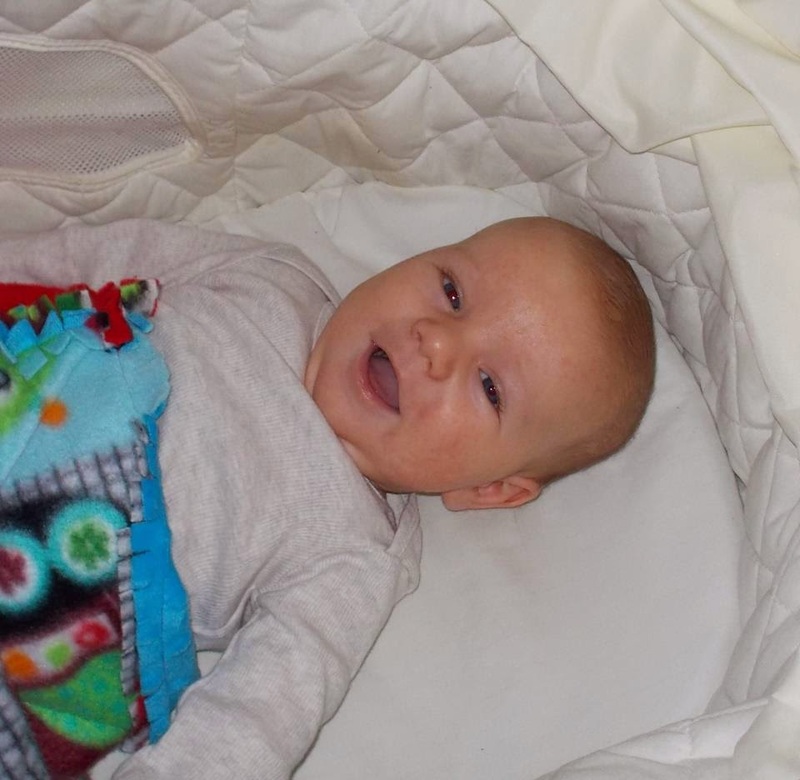 Can you name that baby? 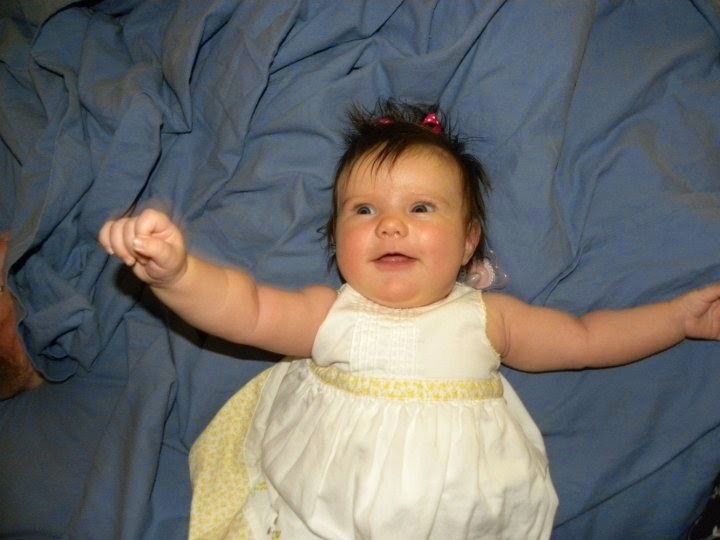 I was browsing through baby pictures of what our little ones looked like at around three months and this is what I came up with. Paul, you better get this right! Tonight before she went to the bed, Maggie came to the kitchen door way and laughed and said "happy, happy, happy" many times. And I have to say... that moment totally made my day! 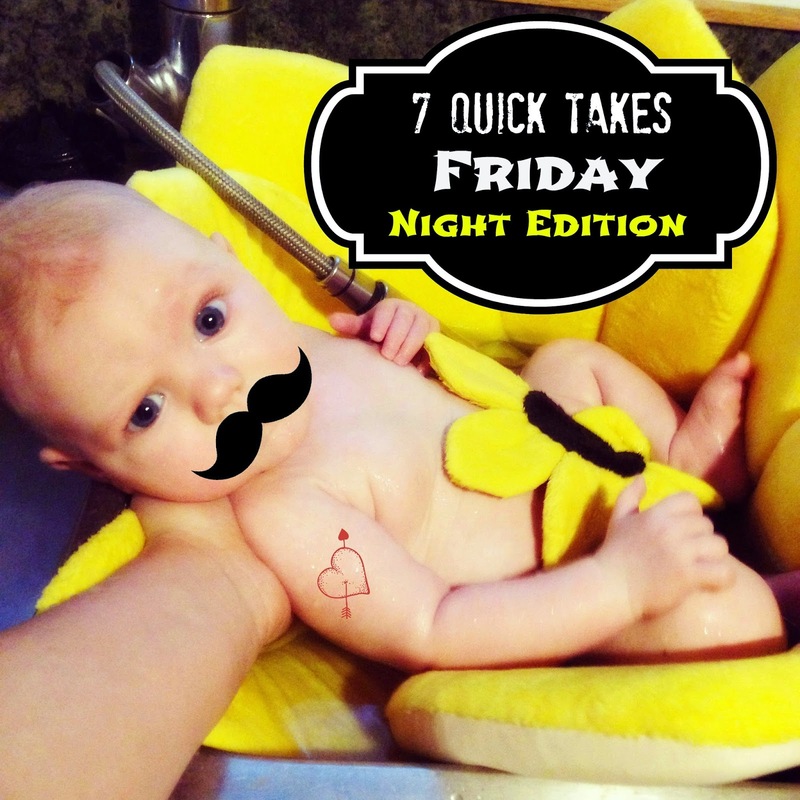 For more 7 Quick Takes head over to This Ain't the Lyceum! Sadie Patch Maggie and James? PS I'm surprised by the snow. (I know it's winter but we haven't had snow since before Christmas so the ground is frozen but bare (in the city). Not complaining when I think of last year and the ice storm. We just got a few more inches this past week. But the composition of this snow couldn't be anymore annoying, I think. We got snow and then it melted into slush, and then it refroze and then we got hit with another snow storm. So when I went out to shovel there were around two inches of ice with powder on top of it! It made me think that the one good (and yet also bad) thing about last year was once it went below freezing it stayed there until it pretty much all melted in spring! Awww, so sweet that they want to share a room! I was sort of shocked by her answer! But it totally made me smile at the same time!